Ayala Malls envision a hub for music, fashion and lifestyle where customers attend the shows, take photos, dress up, interact with designers, writers and radio personalities, and explore their fashionable side. 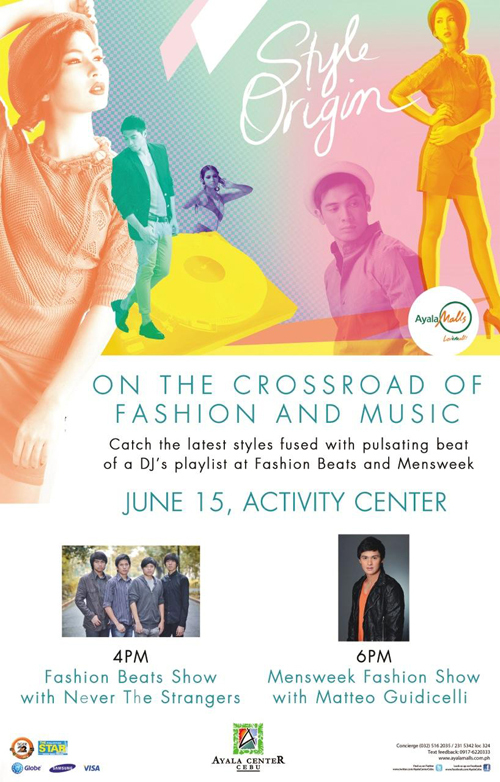 On June 15 to 24 Ayala Malls, Tiger 22 and The Philippine Star invite you to Style Origins at the Ayala Activity Center. Ayala Malls, the premiere lifestyle and shopping destination redefined and elevated retail experience through a reverent series of unique lifestyle initiatives this June. Fashion Beats. High Street Fashion Show with Tiger 22’s DJs and brand ambassadors, a mix of world class and local brands in Ayala Malls will preview the latest collection for Spring-Summer with the latest collection from Top brands such as Bench, Bayo, Kamiseta, Warehouse and more. Local band Never The Strangers on stage with hit single, “Moving Closer”. Mensweek, Dudes taking center stage. Showcases the first ever men’s show in the Philippines, with collections of more than 20 Filipino designers, in Cebu leg are Phillip Rodriguez, Arcy Gayatin, Yvonne Quisumbing, and Cary Santiago. Style Souk. A four-day fashion and lifestyle event that brings together fashionphiles, designers and stylists, along with exclusive deals, freebies and treats. Beauty consultations from Ayala Malls’ partners, Philippine fashion icons and celebrities through Style Souk. Style Star Picks at Ayala Malls for shoppers who have been photographed by Ayala’s roving eye will cap off the event. Strut your style at Ayala Malls and upload your photo in the Facebook Page until June 21 for a chance to win a 25,000 shopping spree and an exclusive feature in Philippine Star. For more information, contact Ayala Center Cebu Concierge Phone number at 032 516-2035 or 032 231-5342 or at Ayala Center Cebu website: www.ayalamalls.com.ph for more details on upcoming shows and events. 0 comments: on "Ayala Center Cebu Style Origin Mensweek Fashion Beat Style Souk and more"